A bunion (a.k.a Hallux Valgus) is a common foot condition associated with a prominent bump on the inside of the forefoot (see Figure 1). The word bunion? comes from the Greek root for the word turnip. Bunions can lead to discomfort over the prominence, especially if patients wear tight fitting shoes. It is common for bunions to run in family? and gradually increase over time. 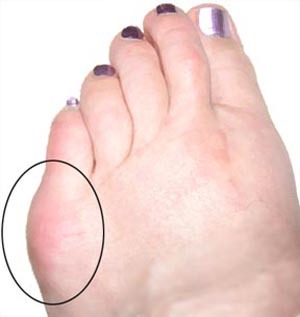 The vast majority of bunions can be managed successfully with basic non-operative treatment. Surgery is reserved for patients who have persistent symptoms in spite of appropriate non-operative treatment.